Visit our Payment Options page to learn convenient ways to pay your bill. 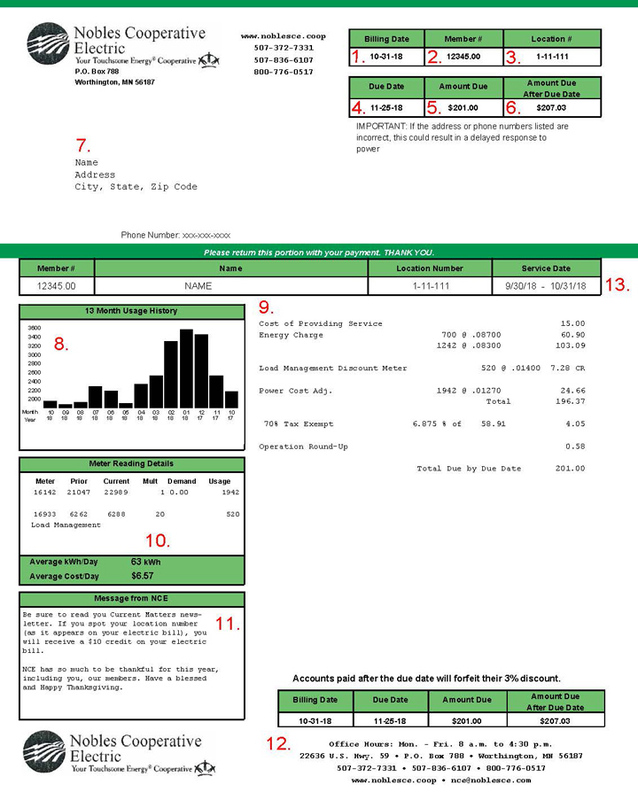 The date your bill NCE prints your bill. The due date of your bill is listed here. The total amount due for all of your services; you must pay this balance by the due date to avoid late charges. This is the amount you should pay if you are not paying by the due date. The name and address of the party responsible for the account. The mailing address may be different than the actual service address. A monthly usage graph with up to 13 months of history for the service. The detail of charges for this location. It also shows total current charge amount. Message center relays important information about NCE. Learn our location, office hours and how to contact the cooperative. The dates you are being billed for on your statement.